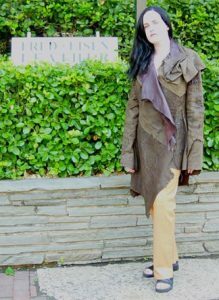 Our Featured Designer, Melissa Nevis Kirgan, had worked for both Fred Eisen of Fred Eisen Leather, and Sharon Flanagan of New Hope Leather before enrolling at the Fashion Institute of Technology in New York City. Melissa graduated from FIT with honors and won two critics awards. She then went on to study fashion, representing the USA at the Fashion Classics at the Rittoni Italian Moda in Italy for a year. After returning from Italy she worked at the “House of Field” for Patricia Field, and helped to start a group called Emerge, helping young talented designers to become recognized. Now on her own, we are proud to present some of her finest one-of-a-kind pieces. 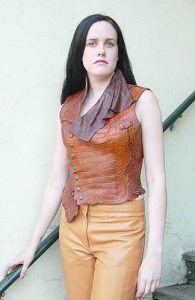 Nevis Alligator Vest This one-of-a-kind full skin Horn Back Alligator Vest is fully lined in butter soft calf leather. Price $3800. 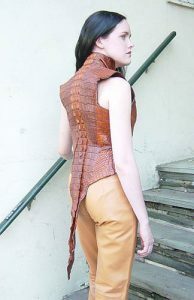 Nevis Alligator Vest – A great accessory to dress up any occasion. It is a size 6. Price $3800. Nevis Leather Coat All green Lamb Leather Coat with butter soft calf lining, brings fantasy to the foreground. Price $2800. Nevis Leather Coat It can be worn as elegant evening ware or a casual afternoon about town Size 6. Price $2800. Nevis Wool Coat This very wearable award winning design has been sold.